Many gardeners often wonder how to get rid of groundhogs that ruin their beloved vegetables or flowerbeds. This can be a difficult undertaking. However, if you have witnessed the damage that these furry critters can cause, you are probably ready to try anything to get rid of them. Take a look at a these ideas on how to get rid of groundhogs and decide which method will work best for you. Place objects that move and rattle around your vegetable and flowerbeds - Items such as pinwheels can sometimes scare these shy creatures away from your yard. Put pretty whirligigs around your garden to add a decorative touch that serves a dual purpose. String aluminum pie plates - Attach the stringed pie plates to a fence, post or tree nearby. As the wind blows they rattle and scare the groundhogs. A more attractive alternative is hanging wind chimes near your garden. Build a fence - Often, this is easier said than done. Groundhogs can jump over or burrow under an ordinary fence. If you feel ambitious, install a chicken-wire fence that is at least three to four feet high with the bottom buried about one foot underground. Angle the fence so that the part underground sticks out slightly toward the outside of the garden. Repellents - Some companies market products that they claim smell like the urine of groundhog predators. The success of these products is questionable but may be worth a shot. Sprinkle Epsom salts on your fruit and vegetable plants - Groundhogs dislike the taste and will avoid eating these plants. Aside from deterring groundhogs, Epsom salts can be beneficial to your plants as well. Unfortunately it also tends to get washed away by rain and will need to be re-applied frequently. Try rags soaked in ammonia - Place them around your garden. This will last a little longer than the Epsom salts but will also need to be renewed periodically. Trap and remove them - This is the most effective means of eliminating these pests from your yard. Trapping is best done in late winter or early spring. Place a live trap about five to ten feet from the animal's burrow. You may even want to use a barrier along the sides to create a walkway to the trap. Bait the trap with some tasty garden treats and wait to see who comes to dinner. Expect to catch other critters before your target animal. Be prepared to release an upset wild animal. No matter what species it is, be sure to wear gloves and keep your hands well out of the way. The last thing you want is to make a trip to the emergency room for stitches. Check with your local Extension Office or Humane Society to find out where you can release your catch. You may even find that these places will allow you to borrow a trap for this purpose. Otherwise, Havahart makes perfect traps for the job. Scroll down to the bottom of the Havahart website and register for their email newsletter to receive a 10% discount on your order. Plant a groundhog garden - Sounds silly, but if you provide a little patch near the groundhog burrow that has been planted with yummy alfalfa and clover, they may not even bother with your garden. More extreme measures - If all else fails and you are ready to get extreme, try to eliminate the problem with the Rodenator. This product claims to eliminate pesky critters and destroy their burrows with a "precision underground shockwave". Now that you have learned how to get rid of groundhogs, you'll want to prevent them from coming back. These little guys can cause a lot of damage, and not just to your garden plants but to people, animals and buildings as well. Burrowing moves large amounts of dirt which can cause problems with building foundations, and people and animals have also been known to step in holes dug by groundhogs. This can cause a broken leg that is not only painful for you but can also lead to costly vet bills for an animal. If you have livestock, such as cattle, you may even lose an animal that is badly injured. This can also be very costly. 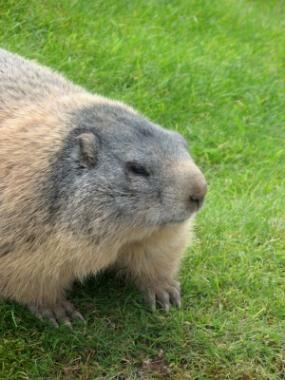 Knowing that groundhogs (also known as marmots, woodchucks or rockchucks) are shy creatures is your first defense. Eliminate hiding places and you will discourage them from taking up residence in your yard. Maintain your yard and garden by cutting down tall weeds and grasses and removing brush piles where groundhogs and other common garden pests like to hide.